These are general options for a view that can be changed. Name Edit the views name, if desired. Description Add or edit a description for this view. Name To change the name of the view, click on the view’s name at the top right of the view editor. Once clicked, a pop-up dialog will appear allowing you to change the view’s name. 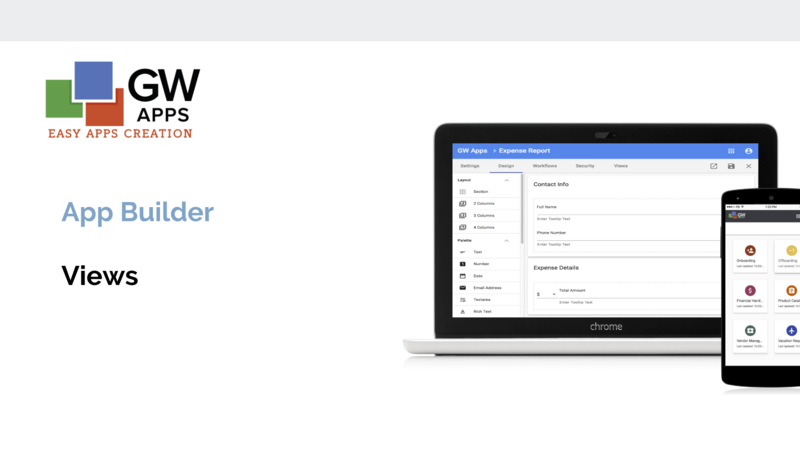 Available Fields Palette A list of the available form fields that can become view columns. To add a field (column) to the view, select it in the Available Fields Palette and drag-and-drop it into the View Attributes list to the right. When you drop, try to place it in the correct location in the the View Attributes list. 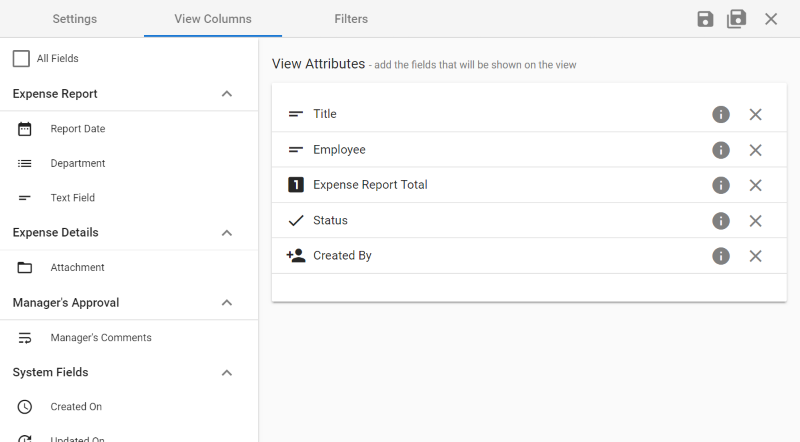 View Attributes A list of the fields (columns) currently in the view. They are displayed in the order in which they will appear in the view. To reorder the selected columns, simply drag-and-drop them within the View Attributes list. To remove a field (column) from the view, click on the X icon on the right end of the column tile. You can further modify your view by applying sorting and filtering to the view. Filters allow you to restrict displayed records to those that match a specific criteria: e.g. Status field value is ‘Completed’. More than one filter can be applied to a view. Default view sorting defines how the records in the view will be sorted when the view is first opened. The user might resort the view after that by clicking on the columns headers. Sort by Sort the view by the selected field. Asc or Desc Sort the view ascending or descending. Click to remove the related sorting condition. Click to add an additional sorting condition. Filters reduce the number of records that display in a view by selecting only ones that meet the defined filter criteria. Value (Text, Date or Number) The value to be compared to. This field is also context sensitive to the type of field selected. If the field is a text or pick from list type of field the value will be a text entry, if it is date field the value will be a date picker, if the field is numeric the value will be a number entry, and if the field is the Status system field then the value will be the a List Selection field with the workflow stages in. Uneditable Enable to make the filter a fixed part of the view design. If the filer is not Uneditable, the application user will be able to override the filter while using the application. If it is Uneditable, the user will be able to apply additional filters, but not remove this one. Click to remove the related filter. Add an additional filter condition. You can further modify your view by setting which roles will be able to see the view. Everyone in the App Everybody who has access to the app will also be able to see this view. Custom Roles If Custom Roles is selected, you will see a list of the available roles in the application. Select the roles that should be able to see this view. Note: If Custom Roles is selected and no specific role names are also selected, then nobody will be able to see the view.